How you care for your yard and take care of your Seville St. Augustine Grass is important – and it shows. 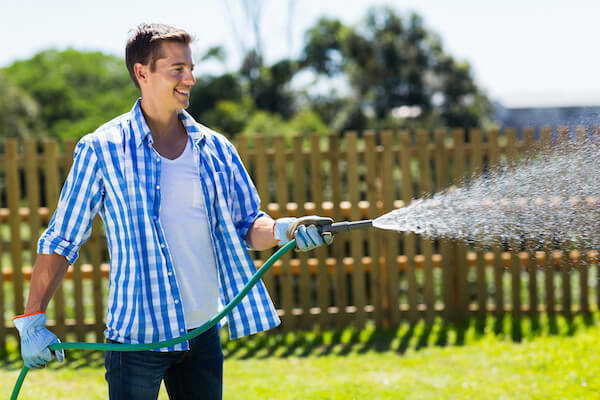 Having a great yard and healthy grass doesn’t just happen, however, it requires proper care, maintenance and protection. This isn’t as daunting a process as it sounds and there is good experienced lawn care help available when you need it too. One of the most popular turf grasses today, Seville St. Augustine is deemed a dwarf cultivar and classified as part of the St. Augustine grass family. It is a hardy grass that retains great color, which will appear as a rich blue-green when thriving. The combination of its unique blade shape, low maintenance requirements and adaptability make it a good choice for landscapers to developers and homeowners. For many, Seville St. Augustine is the grass of choice but like every grass, there are steps we should take to ensure its health, fullness and beauty as it dresses our yards, properties and businesses. Seeding, planting and the early stages of Seville St. Augustine grass will have the greatest impact on the final appearance and health of your yard. Seville St. Augustine grass isn’t particularly sensitive to pH levels, so those higher levels more common to coastal regions aren’t normally an issue. What you will be focusing on is creating a nutrient-rich fertilized soil for planting. Another concern essentially eliminated with Seville St. Augustine grass are the hours of sunlight considerations that may otherwise be a concern for other grass types. That means that Seville St. Augustine grass can survive in more heavily shaded areas with as little as 7 hours or less of sun. Arguably one of the greatest advantages of Seville St. Augustine grass is that it roots quickly. In order to allow your Seville St. Augustine grass to more easily become established you should make sure the soil has good drainage. Other than very high salt levels, there should be little other concern when it comes to helping your grass get a good strong and rooted start. As part of the St Augustine family, although it is a very shade-tolerant grass, it excels in optimum sunlight and warm conditions. Availing as much sun to your Seville St. Augustine grass as possible will promote its deepest color and the most robust growth. Also being a grass within the dwarf class it is fine and even advisable to keep this branch of the St Augustine family shorter than its fellow grass relatives. Cuts as low as 1 1/2 inches are perfectly fine for Seville St. Augustine grass. Another benefit of Seville St. Augustine is that because of its growth pattern and natural density, a skipped cut or two won’t be as likely to show as Seville St. Augustine tends to hide uneven or overgrown grass. If you want to have Seville St. Augustine be the carpet for your yard and the rug you play on outside, sodding or plugging are the two primary options. While both options have their benefits and may suit different situations the use of sod is the fastest way to convert. Caring for your installed Seville St. Augustine grass should be something your installer discusses with you to ensure that your grass establishes quickly and gets a healthy start. Among the different types of St Augustine grass, none are as easy to care for and grow as Seville St. Augustine grass. No other grass in this family is as adaptable and strong which is certainly a big reason behind the widespread use and popularity of Seville St. Augustine. If low-maintenance, fullness and durability are features you would like to invite into your yard, Seville St. Augustine is a great choice. Of course, there are the other aforementioned benefits of Seville St. Augustine and like every grass, there are also pros and cons to each. When it comes to caring for your grass though, it is hard to find the cons with Seville St. Augustine. That might be the very best thing about Seville St. Augustine grass, not only does it work in almost any yard, it also doesn’t require much care – but it will make it look like you do.